Digital Director Dayle Duggins rolled alongside the Springfield Roller Girls for a scrimmage and a few wipeouts. 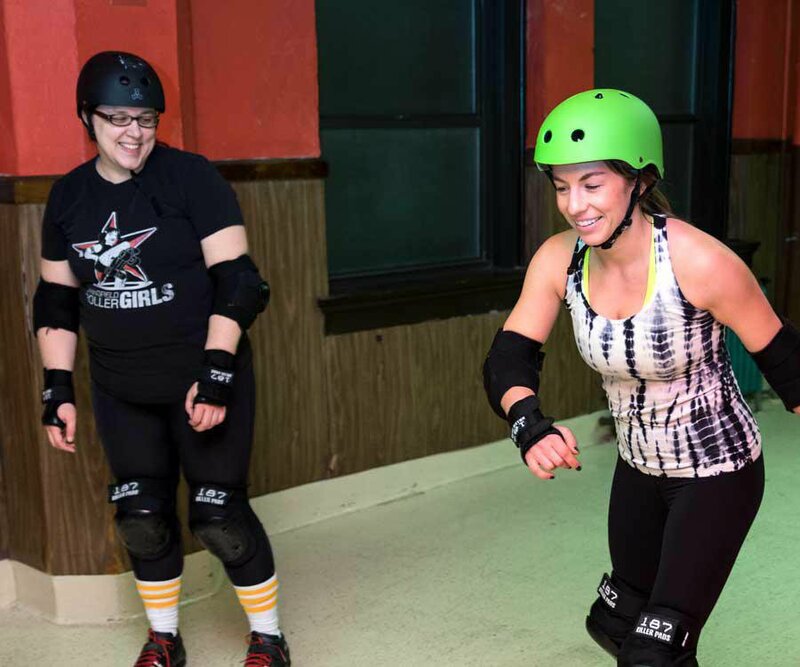 Flat track roller derby that combines cardio, strength, agility and grit. To become an SRG, you must identify as female and be at least 18 years old. Or, if you’re male, you can become an official. Message @SpringfieldRollerGirls on Facebook to get involved. When I turned 26, my friends and I celebrated with a psychedelic birthday bash at Skateland. Our outfits included disco ball–inspired pants, exposed chest hair, massive peace sign earrings, fake mustaches, lots of tie-dye and a fluffy, blonde afro wig. The $3 entry fee included classic roller skates, which made our outfits look even more legit. Although we looked like we had just emerged from the set of Skatetown, U.S.A. our skating skills didn’t match up. My generation quickly slid out of quads and into rollerblades, so the day consisted of lots of falls and jealous glares at children gliding around the glossy hardwood rink. Nearly a year later, I learned I’d be strapping my feet into quads once again for a story on the Springfield Roller Girls (SRG). This one might hurt. Modern roller derby is a product of Austin, Texas. Its revival came in the 2000s, and the Springfield Roller Girls formed in 2006. There’s no ball, so scoring is harder to conceptualize than with traditional sports. The game is played in increments called jams, which last up to two minutes. During jams, both teams field up to five skaters: four are blockers and one is the jammer. 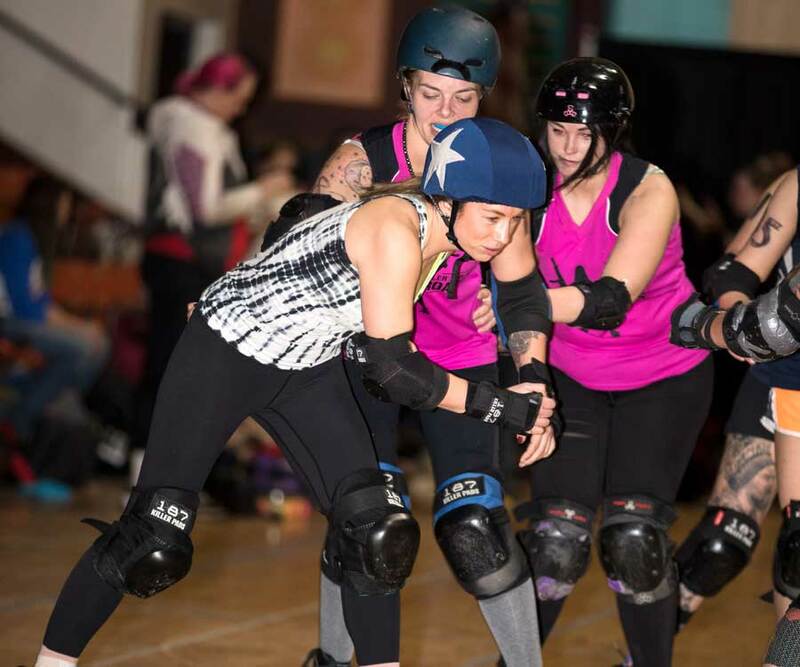 The jammer wears a helmet cover with a star on it and scores points by breaking through the opponent’s blockers and continuing to skate around the track. This means blockers have to play offense and defense simultaneously, which, according to many of the SRG, is the hardest part of the whole game. 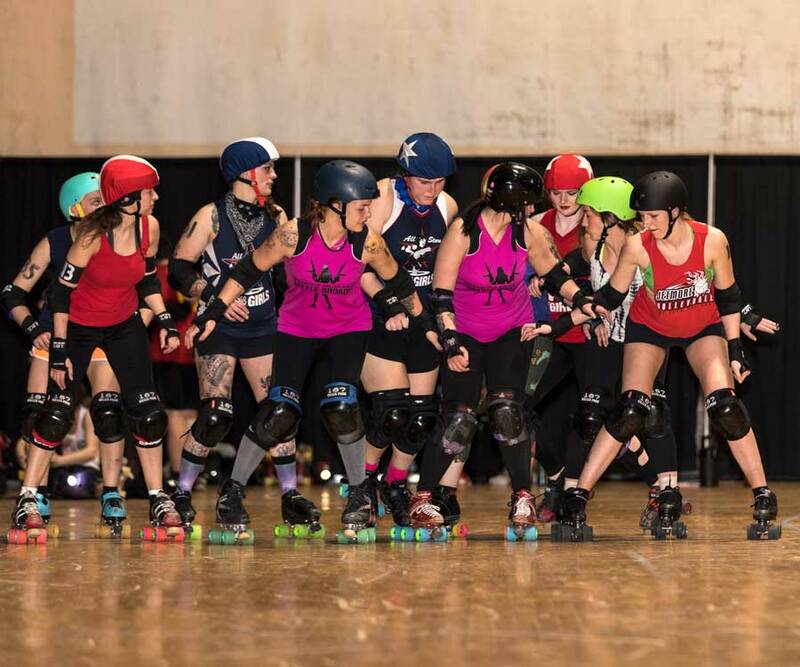 It takes at least eight to 12 weeks for new skaters, or fresh meat, to join the Springfield Roller Girls on the rink, but the SRG let Dayle Duggins (green helmet) give rolling a try during one of their scrimmages. 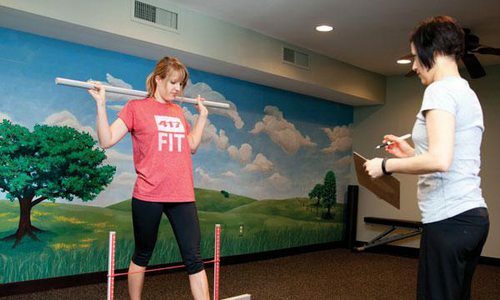 SRG “strives to empower local women by offering them an alternative way to stay physically fit as well as an opportunity to become part of a strong sisterhood,” according to its Facebook page. The team is a member of the Women’s Flat Track Derby Association, and there are hundreds of other teams around the world as far away as London and Australia. Their games, played at the Shrine Mosque, are free. This year, the team has made an effort to donate time and money to charitable partners like GALAGXY, part of the GLO Center of the Ozarks, throughout the season. For a little more than an hour, she taught me how to stop, fall, block, hit and whip in one of the Shrine’s hallways. Stopping is so hard, and I would still prefer to slam into a wall like a 5-year-old to control my speed. Learning how to whip was probably my favorite part because of how much speed you can gain. A whip is an assist technique in which a skater uses another skater’s momentum to propel themselves forward to break through the blockers. Dayle Duggins tries to score a point as the SRG’s jammer during a practice at Shrine Mosque. While learning the basics, I fell a few times but didn’t feel nearly as out of control as I had during my Skateland celebration. 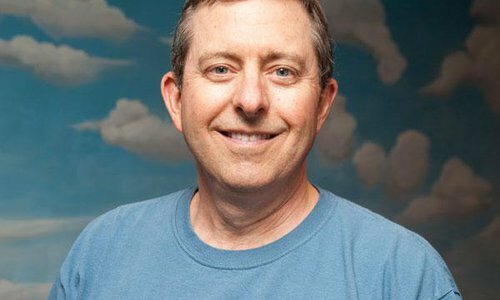 Having a helmet, mouthguard, elbow pads, knee pads and wrist guards made me feel more confident and not as afraid to ruin years of orthodontics. I watched the team scrimmage for the rest of the night, which answered the majority of the questions spinning around in my head about scoring, rules and more. The players weren’t holding back against their teammates. “If we don’t learn to take a hit, the other people are gonna hit us a lot harder,” says SRG President Mia Peck, AKA Mischief in Action. Finally, at the end of the scrimmage, it was my time to skate and shine. I made my way to the track and got to block and jam for about 10 minutes. Because it’s so easy to get injured in roller derby, the team went easy on me but still practiced hits, blocks and whips. I got knocked down a few times, but I didn’t leave bloodied or bruised too terribly. Breaking through the blockers gives you a little bit of an adrenaline rush, just like blocking out a jammer does. I don’t know that I will be incorporating roller derby into my weekly workout routine, but I know that my legs would be burning through two-hour practices and even tougher games. If I ever do make my debut on the ring, just call me DayleDozer.